Gambling Ladies is pleased to announce it has recently completed an agreement with Lionhawk Productions to write a screenplay based on the true life story of Elaine Townsend. The script will be written by noted scriptwriter Pamala L. Hall, who has developed dozens of projects for film, television and theater. The working title for the film is Razzle Dazzle, which is quite appropriate for a story about the original Gambling Lady, who rubbed shoulders and conducted business in the post-World War II era with a ensemble of famous personalities that included Hollywood stars, politicians, underworld figures, and Castro-era revolutionaries. If ever there was a real-life story that should be made into a movie, Elaine Townsend lived that life. In fact, a movie was being developed by Hollywood producer Wolfgang Reinhardt in 1950, but production was mysteriously halted before the film was made. The unknown reason for halting production after Lucille Ball had already agreed to play the starring role is just one of the many fascinating aspects of the mysterious and adventurous life of Elaine Townsend, the glamorous woman who was born Margaret Helgeson in Wyoming, changed her name and made her first foray into business in Hawaii in the days before and after the attack on Pearl Harbor, and then eventually ran the casino concession at the Grand Casino Nacional in Havana just prior to the revolution. One of the USA’s foremost science journalists during the middle of the 20th Century was Ralph Dighton of the Associated Press. Ralph Dighton’s writings were published in newspapers across the country in the 1950s and ’60s, so in a sense he was America’s voice for explaining the quickly-growing world of science to the masses. Here is an article he wrote that explained the underlying reason for America’s quest to put a man on the moon: Survival Called Basic Reason Behind Haste to Reach Moon. Dighton was based in Los Angeles for much of his career and, before he turned his focus to science, he wrote articles about Hollywood, including one about the history of the fabled Hollywood Hotel. Here is an article that refers to a biography Dighton wrote about Howard Hughes. Margaret Helgeson changed her name to Elaine Townsend while residing in Hawaii during the 1940’s. She was there when Pearl Harbor was attacked and throughout WWII. In early 1947 she became the license holder for craps and chemin de fer (baccarat) at the only legal casino in Havana: Gran Casino Nacional. By late 1949 she had an interest in the Jockey Club at Oriental Park and the Montmarte Casino. After 1950 I don’t know what, if any, interest she had in Cuban gambling. The story of how she got into the gambling business in Havana reads like a Hollywood script. 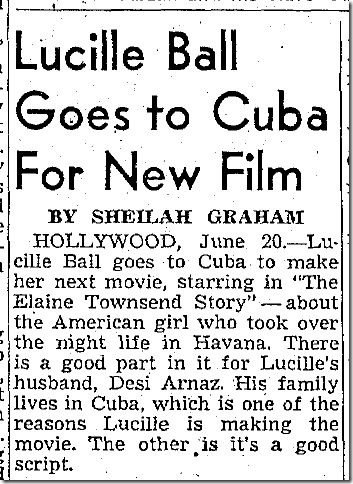 I guess that’s why Hollywood screenwriter Virginia Kellogg wrote a screenplay about her life after visiting her in Cuba in the late 40’s. 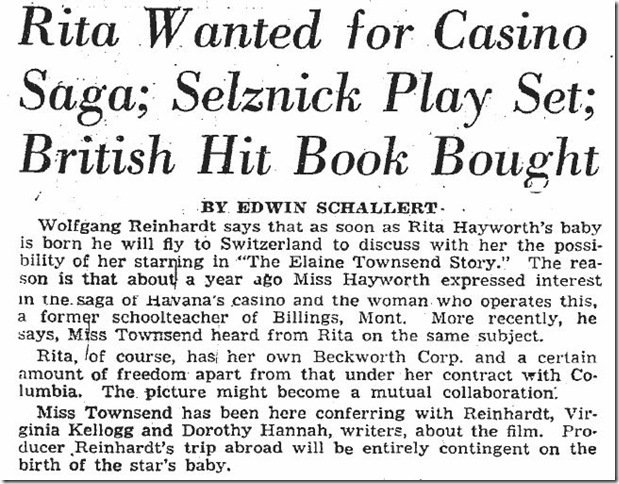 Hollywood producer Wolfgang Reinhardt wanted to make the movie and have Rita Hayworth play the role of Elaine. Elaine Townsend died at Miami Beach, FL and was interred Mount View Cemetery in Billings, Montana on August 11, 1965 (although she had never lived in Billings, that’s where her family had moved from Wyoming). I’ve attached an article in PDF from the Sept.9, 1948 issue of “The American Weekly” (it was a Sunday supplement similar to Parade Magazine today). Has a nice pic of Elaine sitting in front on a lot of chips. The article says that, since Elaine knew nothing about gambling, she hired a former New York nightclub owner named Connie Immerman to manage her games. Immerman was an associate of Lucky Luciano in Cuba (Frank Sinatra said that Luciano was first introduced to him by Immerman). Luciano was deported from Cuba about the same time Elaine get’s there. How she managed to get into the thick of the gambling world in Cuba with no experience whatsoever, while some of the most experienced, big time gamblers and underworld figures on the planet are all around—it’s strange. Thanks for your interest in Gambling Ladies. To learn more about this mysterious lady and the historic time and place in which she lived, read The Elaine Townsend Story. 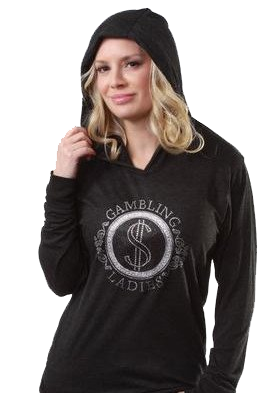 GamblingLadies.com is the internet home of Gambling Ladies apparel. While creation of the full site is completed, we thought we would give you a little preview. Gambling Ladies apparel was inspired by Elaine Townsend, Great Aunt of the founder of Gambling Ladies apparel. Elaine Townsend was the ultimate gambling lady owning two casinos in Havana Cuba during the 1950’s. She became the only female gambling impresario in the world. By age 31, Elaine was managing the two hottest nightclub gambling halls in Cuba, Montmartre and the Jockey Club. These two swank casinos dominated the market during Elaine’s era and she was handling twice the business of her nearest rival. Her gambling interests in the Montmartre and the Jockey Club earned her a fortune to match her million-dollar figure. 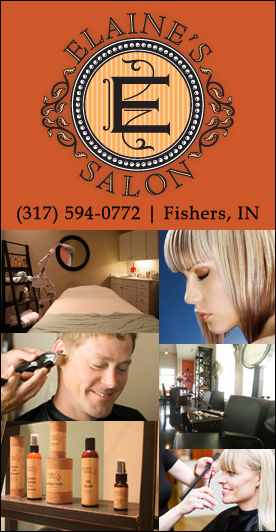 Elaine brought energy and passion to her business and was quite the mover and shaker. Seven nights a week this tall demure beautiful blonde could be seen strolling gracefully among her dice and roulette tables. Her hallmark was a long ivory cigarette holder and an icy politeness that was befitting of a veteran gambler. If Elaine were alive today she would be honored to see what we have built in her name, which is an elegant and timeless line of apparel and accessories paying homage to her gambling heritage. If you are interested in obtaining information about our apparel or what is currently available, please email us using the link below. To learn more about this mysterious lady and the historic time and place in which she lived, read The Elaine Townsend Story. Thanks for your interest in Gambling Ladies.